“I am NOT drinking any f#*!ing merlot!” A classic line delivered by Paul Giamatti’s winetastic character, Miles Raymond in the film Sideways, a movie that helped energize the global wine boom of the last decade. Miles would surely feel at home with a visit to South America’s burgeoning wine country — where there are plenty of selections to choose from, including merlot. Leading the way in wine production and exportation is South America’s western coastal nation of Chile. Surprisingly, this country of 16 million people has become the world’s fifth-largest exporter of wine in a very short period of time. 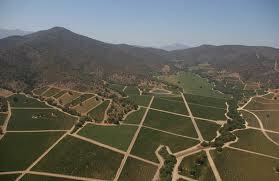 Over a ten-year span, the number of wineries in Chile exploded from just 12 in 1995 to over 70 in 2005. This is not to say that Chile or its eastern-neighbor Argentina, the fifth-largest producer of wine in the world, are new to the art of wine making. In fact the production of wine in South America has a deep history that dates back to the 1500s when Spanish conquistadors and missionaries brought wine from Europe to the region. 3) Drinking as much wine as I could get my hands on. Fortunately, the latter is far easier to accomplish and at a fraction of the cost.